IRELAND’S JAMES MCCLEAN has made a donation of £3,000 to a young child in Northern Ireland who is battling an aggressive form of eye cancer. The Belfast Telegraph reports that the Ireland and West Brom player donated the money to 17-month-old Caleb Williamson via a JustGiving page. The money will go towards covering the travel costs to Switzerland for specialist treatment, and alleviate the financial pressure on Caleb’s parents Jacqueline and Darren, who have five other children between them. Caleb’s mother Jacqueline told the Belfast Telegraph that she was shocked by McClean’s incredible gesture. “I couldn’t believe it when I saw it. I was completely and totally lost for words and in total shock. It’s just amazing that someone could help us like that. She added that she emailed McClean’s wife Erin to thank them for their help. “To be honest I struggled to find the words. It was emotional and I didn’t know what to say. I told her that I could never thank James and her enough, and that it was amazing what they did for our family. According to the newspaper, Caleb was diagnosed with retinoblastoma at just nine weeks old and began chemotherapy treatment shortly after. His family have been travelling between Belfast and Dublin for Caleb’s treatment. Email “James McClean makes £3,000 donation to young child battling eye cancer”. 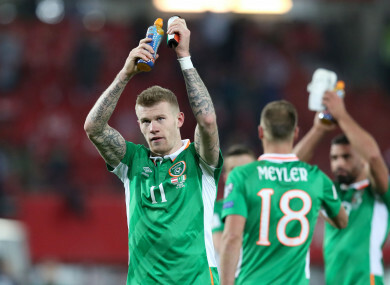 Feedback on “James McClean makes £3,000 donation to young child battling eye cancer”.